From quartet up to 10 piece ensemble of mandolin, mandola, mandocello, mandobass and guitars with a repertoire ranging from baroque to 20th Century sounds. 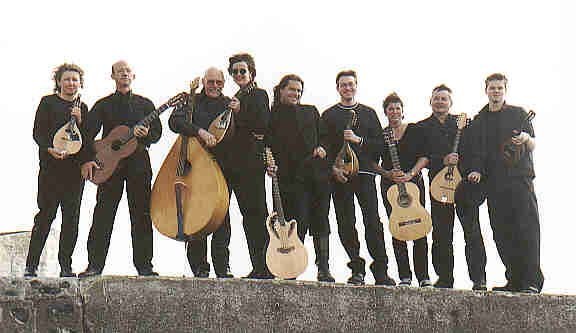 The New English Mandolin Orchestra (NEMO) is an orchestra of mandolins, mandolas, mandocellos, mandobass and guitar, and the members are the cream of the mandolin and guitar world. It plays various orchestral music written for mandolins, such as Maasz’s Concerto for Mandocello, and arrangements of music from Baroque times onwards. NEMO can play from a quartet to ten piece. Their repertoire ranges from baroque to 20th century sounds and they are available for festivals and concerts, weddings, corporate functions or private parties. The Fretful Federation Mandolin Orchestra was founded in Brighton, England by Ian Harris, the leader and musical director of the orchestra, in 1997. His goal was to revive the tradition of mandolin orchestras, which were hugely popular in the UK up until the 1930s. Originally playing standard banjo-mandolin-guitar pieces typical of mandolin orchestras of the beginning of the century, the repertoire of The Fretful Federation is always expanding and developing, and now includes everything from tangos, rumbas and ragtime to classical and contemporary works, fully challenging the range of instruments of the mandolin family. For a varied repertoire, come to one of the concerts. The Fretful Federation regularly takes part in competitions and in 1998 won the Francis Day and Hunter Trophy for ensembles of 6-9 players, and in 1999 and 2000 the Senior Orchestra Coronation Trophy for Entertainment, at the annual British Federation of Banjoists, Mandolinists and Guitarists rallies. The Fretful Federation won the First Prize for Musicianship at the Annual BMG Rally on October 21 2001 with a cracking performance of Konrad Wilki’s Overture in A Major. The mandolin orchestra has members that mirror those of a string orchestra. These include the mandolin, mandola, mandocello, mandobass and the luito, a near-extinct instrument. There is also a guitar section and flute. A mandolin is tuned like a violin but played with a plectrum. It has pairs of strings which give it the characteristic mandolin sound when played vibrato. Most of the orchestral solos are on the mandolin, which also provide a strong high harmony line. These may be backed by mandolas and, in the case of the Fretful Federation, several octave mandolas and a mandocello. The bass line is provided by a mando bass played and constructed by a member. Guitars give a strong bass and rhythm line. The flute provides an interesting continuo contrast to solo mandolins.